Objective To assess whether statin treatment is associated with a reduction in atherosclerotic cardiovascular disease (CVD) and mortality in old and very old adults with and without diabetes. Setting Database of the Catalan primary care system (SIDIAP), Spain, 2006-15. Participants 46 864 people aged 75 years or more without clinically recognised atherosclerotic CVD. Participants were stratified by presence of type 2 diabetes mellitus and as statin non-users or new users. Main outcome measures Incidences of atherosclerotic CVD and all cause mortality compared using Cox proportional hazards modelling, adjusted by the propensity score of statin treatment. The relation of age with the effect of statins was assessed using both a categorical approach, stratifying the analysis by old (75-84 years) and very old (≥85 years) age groups, and a continuous analysis, using an additive Cox proportional hazard model. Results The cohort included 46 864 participants (mean age 77 years; 63% women; median follow-up 5.6 years). In participants without diabetes, the hazard ratios for statin use in 75-84 year olds were 0.94 (95% confidence interval 0.86 to 1.04) for atherosclerotic CVD and 0.98 (0.91 to 1.05) for all cause mortality, and in those aged 85 and older were 0.93 (0.82 to 1.06) and 0.97 (0.90 to 1.05), respectively. In participants with diabetes, the hazard ratio of statin use in 75-84 year olds was 0.76 (0.65 to 0.89) for atherosclerotic CVD and 0.84 (0.75 to 0.94) for all cause mortality, and in those aged 85 and older were 0.82 (0.53 to 1.26) and 1.05 (0.86 to 1.28), respectively. Similarly, effect analysis of age in a continuous scale, using splines, corroborated the lack of beneficial statins effect for atherosclerotic CVD and all cause mortality in participants without diabetes older than 74 years. In participants with diabetes, statins showed a protective effect against atherosclerotic CVD and all cause mortality; this effect was substantially reduced beyond the age of 85 years and disappeared in nonagenarians. 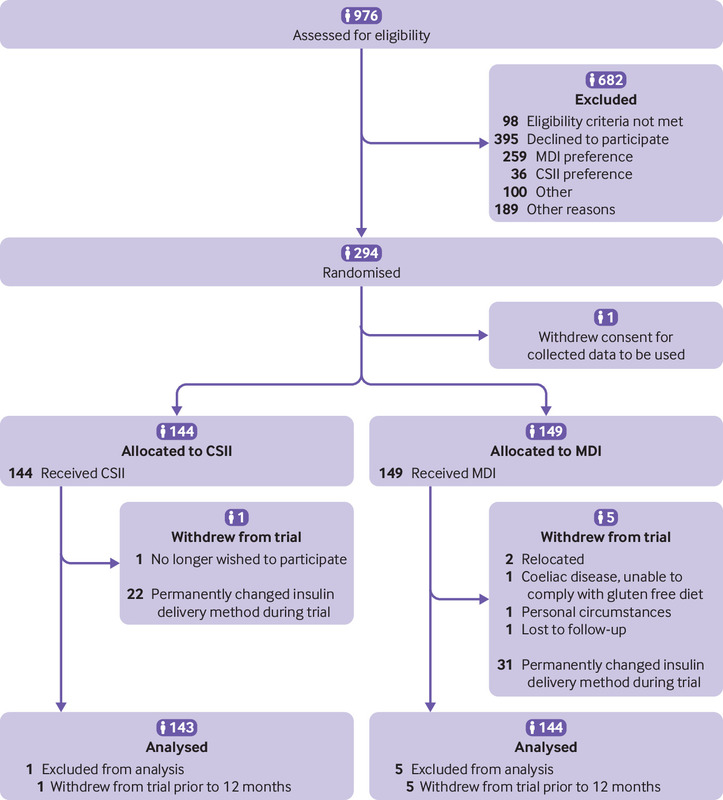 Conclusions In participants older than 74 years without type 2 diabetes, statin treatment was not associated with a reduction in atherosclerotic CVD or in all cause mortality, even when the incidence of atherosclerotic CVD was statistically significantly higher than the risk thresholds proposed for statin use. In the presence of diabetes, statin use was statistically significantly associated with reductions in the incidence of atherosclerotic CVD and in all cause mortality. This effect decreased after age 85 years and disappeared in nonagenarians. Cardiovascular disease (CVD) is the leading cause of death globally.1 Older populations are especially vulnerable to CVD, with incidence and mortality rates almost three times higher in those older than 74 years than in younger people.2 In addition, projections of population growth anticipate that people older than 74 years will represent more than 10% of the population in developed countries in 2050.3 Consequently, prevention of CVD in this population will be a major worldwide health policy challenge during the next decades. The older population might also be more susceptible to adverse effects and drug interactions owing to comorbidities and polypharmacy, although these aspects have been poorly studied.21 In this scenario, decisions on statin use in people older than 74 years are made individually and are not supported by high quality evidence; further research is needed.17 We assessed whether the use of statins was associated with a reduced incidence of atherosclerotic CVD and mortality in older people initially free of CVD, by type 2 diabetes and age. We carried out a retrospective cohort study using data from the Spanish Information System for the Development of Research in Primary Care (SIDIAP). This is a clinical database of anonymised longitudinal patient records of more than six million people (80% of the Catalan population and 10% of the total population of Spain) registered in 274 primary care practices and with a total of 3414 general practitioners.22 A subset of records from general practitioners who surpass predefined data quality standards23 constitutes the SIDIAPQ, which provides research quality anonymised data on approximately two million patients, attended by 1365 general practitioners, yielding nearly 14 million person years of clinical data for 2005-15. The information recorded includes demographic and lifestyle factors relevant to primary care settings (eg, body mass index, smoking status, alcohol use); clinical diagnoses, outcomes, and events (coded according to the international classification of diseases, 10th revision); referrals and hospital discharge information (international classification of diseases, ninth revision); laboratory tests; and prescribed drugs that have been dispensed by community pharmacies. The high quality of SIDIAPQ data has been previously validated and the database has been widely used to study the epidemiology of several health outcomes.242526 Confidentiality in the SIDIAPQ database is rigorously assured by a standardised system of codification that involves all possible identifier variables, which are not available to investigators. All individuals registered on SIDIAPQ aged 75 years or older with at least one visit recorded in the electronic medical records during the 1.5 years before the index date were eligible for inclusion. We excluded those with a history of CVD, defined as any of several conditions: symptomatic peripheral arterial disease, ischaemic and haemorrhagic stroke, heart failure, and coronary heart disease, including non-fatal angina, non-fatal myocardial infarction, or cardiac revascularisation. We also excluded participants taking drugs to treat cardiac diseases (Anatomical Therapeutic Chemical code C01), those with type 1 diabetes and a history of lipid lowering treatment (statins or others), and, to avoid frailty bias, people with cancer, dementia, or paralysis, and those receiving dialysis, living in residential care, or with an organ transplant. The study period started in July 2006, with enrolment to the end of December 2007 and follow-up to the end of December 2015. People who moved from the primary care practices that provide data to SIDIAPQ, were accordingly transferred from SIDIAPQ and thus considered to be lost to follow-up. For statin users, index date was the date of the first statin invoice; for non-users, we selected the index date at random according to the distribution of the index date for statin users. We identified the onset of cardiovascular diseases during follow-up using relevant SIDIAPQ codes in both primary care and hospital discharge records. Primary outcomes were total mortality and atherosclerotic CVD, a composite of coronary heart disease (fatal and non-fatal angina, fatal and non-fatal myocardial infarction, or cardiac revascularisation), and stroke (fatal and non-fatal ischaemic stroke). We also considered coronary heart disease and ischaemic stroke separately, as secondary outcomes. We present categorical variables as percentages and continuous variables as means (standard deviations) or their 95% confidence intervals, or medians (interquartile ranges), as appropriate. The number of imputations performed was defined according to efficiency and reproducibility based on the fraction of missing information, which measures the impact of the overall missing percentage on the estimated hazard of interest (use of statin).31 To replace missing baseline values of total cholesterol, low density lipoprotein cholesterol, high density lipoprotein cholesterol, triglycerides, glucose, systolic and diastolic blood pressure, and body mass index, we used 10 multiple imputations by chained equations.31 The supplementary file describes the process of multiple imputation and the variables considered in the models. Supplementary material (eTable1) describes the missing data patterns. In addition to incorporating the missing-at-random assumption, we compared case complete results with multiple imputation as a sensitivity analysis (see supplementary file). Because of non-random treatment allocation, we used a logistic model based on potential confounding covariates to calculate the propensity score of statin treatment (see supplementary file for details on the development and assessment of the propensity score model). We calculated the propensity score separately for participants with and without diabetes and also within each age group, and standardised differences before and after adjustment for propensity score. Variables with standardised differences <0.10 were considered to be well balanced. Using Cox proportional hazard regression models adjusted by propensity score, we calculated the hazard ratios of statin use for the outcome events. Participants were censored at the date of transfer from SIDIAPQ or at the end of the study period. For each group (based on age and type 2 diabetes status) in each imputed dataset we calculated 10 propensity scores and 10 hazard ratios. A pooled hazard ratio was then calculated according to Rubin’s rules, with propensity score as covariate. To prevent residual confounding we performed additional regression adjustments after adjustment of propensity score. Variables that remained imbalanced after propensity score adjustment were also included in the models. The proportionality of hazards assumption was tested. We also calculated the absolute risk reductions and one year number needed to treat for one additional patient to survive without reaching an endpoint. We analysed the data using a simulated intention to treat scenario, where subsequent changes in treatment of the participants who used or did not use statins did not modify the category of use or study ending time. In an additional sensitivity analysis, we used a Fine-Gray semiparametric proportional subdistribution hazards model for the main cardiovascular outcomes, considering all cause mortality as a competitive event. This model was also adjusted by the same propensity score used in the Cox model. We stratified all the analyses by diabetic status. For the relation of age with effect of statins, we performed two parallel statistical analyses. The first was a categorical approach stratifying the analysis by age group: old (75-84 years) and very old (≥85 years). The second was a continuous analysis using an additive Cox proportional hazard model. To model the effect of age in users and non-users separately we used thin plate regression splines. No patients were involved in setting the research question or the outcome measures, nor were they involved in the design or implementation of the study. No patients were asked to advise on interpretation or writing up of results. There are plans to disseminate the results of the research to the relevant patient community. Between July 2006 and December 2007, 46 864 people fulfilled the inclusion criteria, of whom 7502 (16.0%) started statin treatment (fig 1). Median follow-up was 7.7 years (interquartile range 7.2-8.0 years). The highest fraction of missing information associated with the hazard of interest (use of statins) was less than 0.1. Therefore, 10 imputations would be enough to ensure efficiency and reproducibility. Table 1 shows the proportion of missing data for incomplete variables and a comparison of the complete case dataset and imputed dataset. Mean values of these variables remained similar after multiple imputations. Of those participants included, 7880 (16.8%) had type 2 diabetes. Among those without diabetes, women constituted 64.4% and the mean age was 80.8 (SD 4.7) years. Overall, 58.8% of participants had hypertension, 11.5% were smokers, and 25.5% had hypercholesterolemia. Close to 85% of new users were treated with a statin of low or moderate capacity to reduce low density lipoprotein levels. Among participants with diabetes, 60.4% were women with a mean age of 80.5 (SD 4.3) years. Hypertension was present in 76.2% of participants, 13.7% were smokers, and hypercholesterolemia was present in 29.2%. More than 85% of statin new users with type 2 diabetes were treated with a statin of low and moderate capacity to reduce low density lipoprotein levels. Tables 2 and 3 show the baseline characteristics for statin new users and non-users by age group and presence of type 2 diabetes. After adjustment for propensity score, no statistically significant or clinically relevant standardised differences were observed. 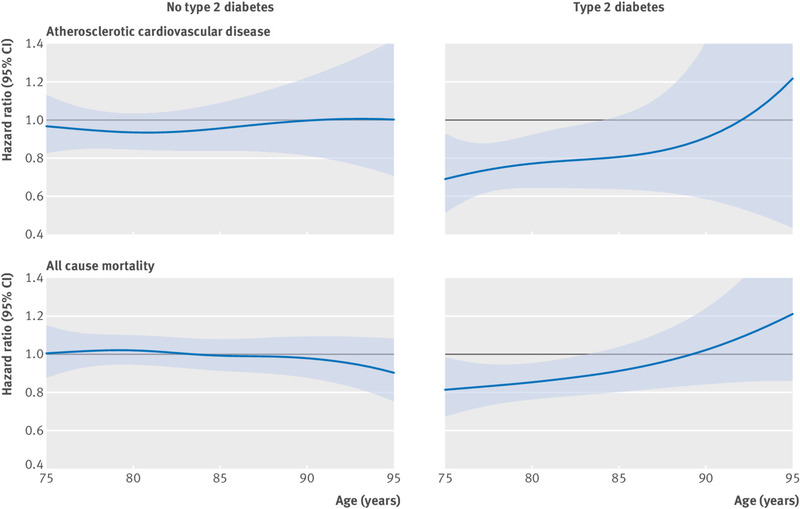 Number of events, event rates per 1000 person years, and hazard ratios (95% confidence intervals) of coronary heart disease, stroke, atherosclerotic CVD, and mortality in the 75-84 years and 85 years or older age groups are presented for participants without diabetes (table 4) and for those with diabetes (table 5). The proportionality of hazards assumption was met in all the groups and for all the outcomes except for coronary heart disease in the population aged 85 or older with diabetes, in which case we considered a time exposure interaction in evaluating the Cox model. In participants without diabetes, the hazard ratios for statin use were 0.94 (95% confidence interval 0.86 to 1.04) for atherosclerotic CVD and 0.98 (0.91 to 1.05) for all cause mortality in 75-84 year olds. Similarly, no benefit was observed for participants without diabetes aged 85 years and older: 0.93 (0.82 to 1.06) for atherosclerotic CVD and 0.97 (0.90 to 1.05) for all cause mortality. In participants with diabetes, the hazard ratios for statin use were 0.76 (0.65 to 0.89) for atherosclerotic CVD and 0.84 (0.75 to 0.94) for all cause mortality in 75-84 year olds. The one year number needed to treat was 164 for atherosclerotic CVD and 306 for all cause mortality. In participants with diabetes aged 85 years and older, the hazard ratios were 0.82 (0.53 to 1.26) for atherosclerotic CVD and 1.05 (0.86 to 1.28) for all cause mortality. Similarly, in the estimation of hazard ratios for each year of age (fig 2), those for the use of statins remained close to 1 in participants without diabetes and statistically non-significant, regardless of the age, for atherosclerotic CVD and all cause mortality. In contrast, in participants with diabetes the hazard ratios showed a statistically significant and clinically relevant (ranging from 0.7 to 0.8) reduction in atherosclerotic CVD. This reduction lost statistical significance at age 85 years. Statins also showed a protective effect against all cause mortality in participants with diabetes; however, this effect began to lose statistical significance at age 82 years and definitively disappeared in participants aged 88 years or more (fig 2). The case complete analysis showed no statistically or clinically relevant differences from the hazard ratio obtained in the analysis of the dataset with multiple imputations (see supplementary eTable 2). The same occurred with the competing risk analysis, which did not differ from the Cox analysis (eTable 3). We observed no significant increase of adverse events attributable to statins (tables 4 and 5). Our results show a lack of association between statin treatment and reduction in atherosclerotic CVD events or all cause mortality in the absence of type 2 diabetes mellitus in old and very old groups, although the incidence (ie, risk) of atherosclerotic CVD in both age groups (table 4) was significantly higher than the risk thresholds proposed for statin use in the guidelines for cardiovascular prevention.171819 In participants with diabetes, however, statins significantly reduced the incidence of atherosclerotic CVD, by 24%, and all cause mortality, by 16%, in participants aged 75-84 years. No benefits were observed in participants with type 2 diabetes in aged 85 years or older. 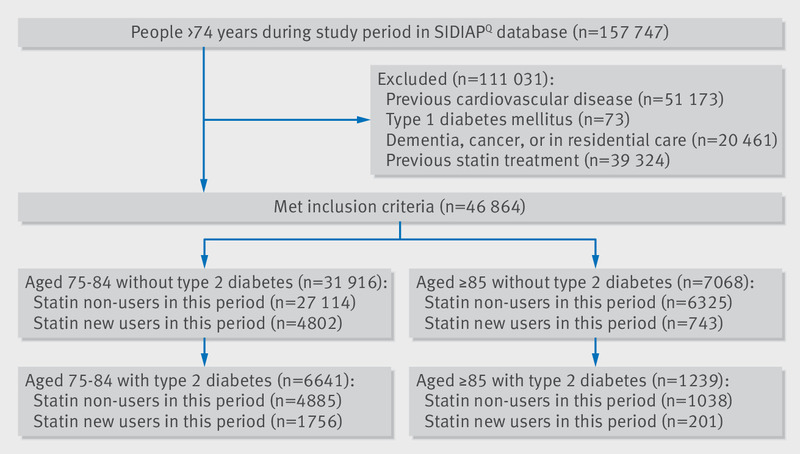 These results do not support the widespread use of statins in old and very old populations, but they do support statin treatment in selected people such as those aged 75-84 years with type 2 diabetes. Similarly, the analysis of the effect of age in a continuous scale using splines corroborated the lack of beneficial effect of statins for atherosclerotic CVD and for all cause mortality in participants without diabetes and older than 74 years. Statins showed a protective effect against atherosclerotic CVD in participants with diabetes, which began to lose statistical significance at age 85 years and definitively disappeared in those aged 92 years or older. Statins also showed a protective effect against all cause mortality in participants with diabetes, which began to lose statistical significance at 83 years of age and definitively disappeared in those aged 90 years or older. These results are clinically plausible because age itself may be the main contributor to death at these advanced ages. However, we acknowledge the limited sample size of the group of participants with diabetes aged 85 years or older, with few statin new users and few events and therefore with limited statistical power. We cannot rule out the possibility that this small sample was responsible for the lack of effect observed. Larger observational and clinical studies are needed to elucidate the effect of statins in this subgroup. In addition, the relatively low baseline low density lipoprotein cholesterol level in people with diabetes aged 85 years or older could have contributed to the observed lack of effect in this group. It is rather complex to establish a precise cut-off point for the age at which statins no longer have a beneficial effect in people with diabetes. However, in our data the effect was substantially reduced after age 85 years and disappeared in nonagenarians. Extrapolations of these findings to the population aged 75 years or older should be done with caution because all these studies included a large proportion of participants younger than 75 years, leading the results towards the beneficial effect of statins observed in younger people. In a recently published post hoc analysis of the ALLHAT-LLT study,12 which included patients with both hyperlipidaemia and hypertension, the authors performed a subanalysis including 726 people aged 75 years or older (375 receiving pravastatin and 351 receiving usual care) and found no reduction in all cause mortality or in CVD. Our results in participants without type 2 diabetes are in line with those of the ALLHAT-LLT study. However, no previous studies had specifically analysed the effect of statins in people with diabetes aged 75 years or older, and we found a different scenario from that observed in participants without type 2 diabetes: the observed benefits were not only statistically significant but also clinically relevant, because statin treatment was associated with an absolute reduction in cardiovascular events of about 7 per 1000 people treated for one year and more than 3 per 1000 individuals treated for one year in overall mortality in the group aged 75-84 years. These results are in accordance with the idea that diabetes increases the risk of vascular events and mortality regardless of age, and this increase is even more pronounced in people who have had diabetes long term,39 or when multiple cardiovascular risk factors coexist,40 as is common among older people. In our study, participants with type 2 diabetes had a higher prevalence of other cardiovascular risk factors (hypertension, hypercholesterolemia, tobacco use, obesity) than the general population of the same age (tables 2 and 3), and the incidence of cardiovascular disease in those with diabetes was more than 50% higher than in those without diabetes. Following current guidelines, most of the population in our study would be suitable candidates for statin treatment because the incidence of CVD in the control group was well above the risk threshold of 10%. However, statins were only protective in those with type 2 diabetes and younger than 85 years. Thus, our results do not support these recommendations in old and very old people without diabetes, and they raise an important question: whether the current risk threshold for statin indication (10% risk of atherosclerotic CVD at 10 years) is appropriate in this population. Statin use was not associated with an increased risk of myopathy, liver toxicity, or incidence of type 2 diabetes. An increased incidence of diabetes,4546 myopathy,47 and hepatopathy48 has been reported, mostly in intensive regimens; in our study, 85% of statin regimens were of low to medium potency. Additionally, mild myopathy or hepatopathy could be underestimated in electronic medical records. In line with previous studies, our results showed no increased risk of cancer or haemorrhagic stroke associated with statin use.4950 Even so, the possibility that longer duration of statin use might have shown an increased incidence of diabetes, cancer, or haemorrhagic stroke cannot be dismissed. A major strength of this study was the high quality, internally validated, database of electronic medical records that provided a large sample size, ensured high external validity,24 and reflected real life clinical conditions by including participants often excluded from clinical trials. For instance, the high proportion of women in our study coincides with the general population in this age group.51 Furthermore, data on statin use were obtained from official pharmacy invoicing records of the national health service. Several general limitations are inherent to observational studies using medical records. Firstly, residual confounding is a possibility, especially by indication; we used a new users design and then adjusted by propensity score in each age group and stratum of type 2 diabetes status. Additionally, we used sample restriction (excluding patients with cancer, dementia, or paralysis and those receiving dialysis, in residential care, or with an organ transplant) to reduce the healthy user bias.52 Despite these efforts, we acknowledge that some residual confounding might exist. This would affect the results because propensity score adjustment can account for some confounding but not all. The lack of data indicating ethnicity is another limitation of the study. Our database does not include this variable. Although ethnicity could potentially affect the study results, it is reasonable to assume that the study population is mostly white. In Catalonia, the immigrant population is known to represent a small percentage (<3.5%) of the reference population older than 74 years—that is, most of the population is white. Secondly, missing data can influence results. We imputed the missing values of the continuous variables in the study to avoid the selection bias that might occur when excluding such records. The percentage of missing data ranged from 4.3% (systolic blood pressure) to 20.4% (low density lipoprotein cholesterol) in participants with type 2 diabetes, and from 13.1% (systolic blood pressure) to 43.9% (low density lipoprotein cholesterol) in participants without diabetes, and the characteristics of the complete case analysis did not differ from those of the imputed data (eTable 2). Thirdly, we could not analyse the effect of statins on cardiovascular death, as cause of death is not available in the SIDIAPQ database. We also cannot exclude some underreporting of outcomes, which could lead to non-differential misclassification and reduce statistical power, biasing the results towards the null hypothesis. This issue is especially relevant for the incidence of hepatotoxicity, myopathy, myalgia, fatigue, or weakness, which have an important impact on older people’s quality of life. Future studies should strive to involve patients in evaluating statin use to capture their point of view and experience with the drug. Fourthly, we applied prescription time-distribution matching: random index dates were assigned to the non-users matching the distribution of the users’ date of first prescription.53 This prevents an imbalance in prescription time-distribution between the two groups, which can generate a survival bias.53 Finally, limited statistical power was a weakness in our study, which restricts the possibility of performing a comparative analysis of some subgroups, such as patients receiving treatment with high or very high versus moderate to low intensity statins. These results, based on observational data, may not provide enough grounds for direct clinical recommendations, but they do show the need for randomised clinical trials to further elucidate this problem. Statins for Reducing Events in the Elderly (STAREE study) is a promising ongoing trial on CVD primary prevention that compares atorvastatin (40 mg) with placebo in healthy people older than 70 years,54 but until publication of the STAREE results, expected in 2022, our findings may help to make decisions in clinical practice. Ethnicity differences, sociocultural aspects, lifespan, and characteristics of health systems should be considered when extrapolating these results to other countries. The population lifespan in Catalonia at birth (83.2 years) is higher than the average lifespan in Europe (80.6 years),51 and the public health system provides universal healthcare, including prescriptions, to the whole population, including the present study population (≥74 years old). The effect of statin treatment in primary prevention in the older population varies depending on the presence of type 2 diabetes. Statins were not associated with a reduction in atherosclerotic CVD or in all cause mortality in participants without diabetes aged 75 years or older and free of clinical CVD. In participants with type 2 diabetes, however, statins were significantly related to a reduction in the incidence of atherosclerotic CVD and in all cause mortality. This effect was substantially reduced after the age of 85 years and disappeared in nonagenarians. These results do not support the widespread use of statins in old and very old populations, but they do support treatment in those with type 2 diabetes younger than 85 years.